Shaving is most common part of beauty routines for both men and women. To make easy and smooth shaving, they use commercial shaving foams or creams available in the market. These commercial products are chemical based that can make your skin dry and irritated. But you don’t need to stop using shaving cream because homemade shaving cream is a good alternative to commercial products. It will make your beauty routine natural also save your pocket too. This cream easy to make and some main ingredients will be used are shea butter, extra virgin coconut oil and olive oil. All of these ingredients have moisturizing properties that alleviate dryness and soothe the skin. Also excellent to prevent razor burns. Adding the essential oils in this recipe, it gives a nice fragrance to the shaving cream. 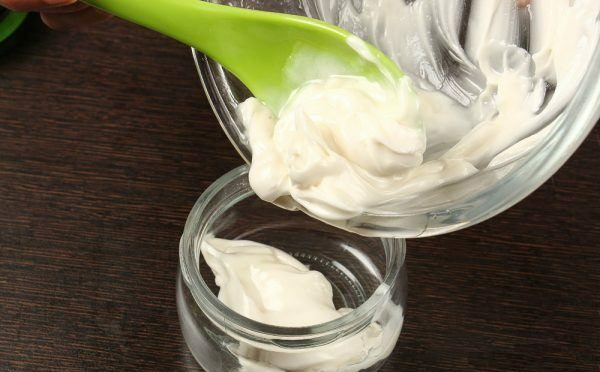 This homemade shaving cream is very moisturizing with delicious smell and completely chemical free. You just apply thin layer on this cream on your skin and shave against the direction of your hair growth. 1. Take a microwave-safe bowl and put 1/3 cup of extra-virgin coconut oil. 2. Add 1/3 cup of shea butter in it. 3. Put this bowl in a microwave and heat for about 1 minute to make them melt. 4. Remove the bowl from the microwave and add 1/4 cup of extra-virgin olive oil. 5. Add both essential oils to the mixture. 6. Mix the ingredients with the help of ice cream stick. 7. Put the bowl in the fridge for at least 2 hours, when the mixture solidifies then let it sit in the room temperature for 15 minutes. 8. Now whip it with the beater for at least 4 to 5 minutes to make it fluffy. 9. Your shaving cream is ready for use. Store it in airtight container in a cool, dark place. You can use it for 1 to 2 months.